Stern objects to Livni's pact with Labor, in letter of resignation from the party noting that Hatnua has strayed too far Left for his views. MK and Res. 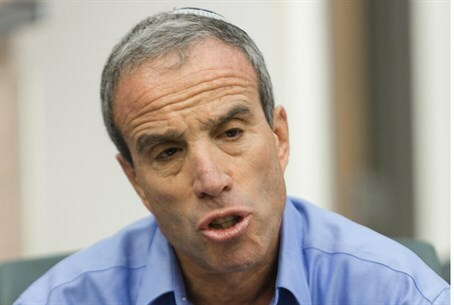 Gen. Elazar Stern has left Tzipi Livni's Hatnua, he stated Saturday night, penning a letter to Livni whereby he cited her decision to join Yitzhak Herzog's Labor party. Stern's full letter to Livni is below. After decades of civil service, military service, and then as a civilian in the fields of social work in Israel, two years ago I responded to your request to continue my activities by means of political channels and to join Hatnua. We agreed that I would concentrate mainly on issues of religion and state, and you guaranteed me my freedom to vote [according to my own opinions - ed.] in political areas. The main issue which I saw as my mission in the Knesset was achieving a fundamental change in the Conversion law that I started when I was in the IDF and saw fit to continue in the Knesset. I am pleased that after much debate and complex political battles the government (also with your help) approved [the Conversion Law] and that its implementation is to begin shortly. In addition, continuing what had been my pursuits prior to the Knesset, I was happy to contribute significantly as a Knesset member in promoting increased rights and benefits for Holocaust survivors as well as other issues. The shortened Knesset term curtailed, unfortunately, other bills I had intended to pursue, including changes to laws on Shabbat, kosher certification, various aspects of IDF service and more. These days, as I announced recently my Facebook page, I am "turning over a new leaf" and examining the right way to continue to serve the public and the state, whether in the legislature and whether in other fields, as I did prior to the Knesset. This action can be expressed in another appropriate political framework, and as mentioned several times in the past, and "going back to civilianship" is a reasonable option for me and I can be of service to the state on issues in which I believe and have acted upon. My friend, MK David Tzur, told you, upon the decision to dissolve the Knesset, before we knew that you would not lead the [Hatnua] list, that we were weighing the possibility of splitting [away from the party, ed.] in order to preserve our rights (also in the party funding) should we decide to leave, whatever the reason. We consulted with a significant number of people, including senior lawyers (including the legal advice Committee) and everyone supported the matter and noted that this is not a legal issue nor is it a moral issue. The only person who objected to it on moral grounds was you. Tzuri (MK David Tzur) and I, if there is but one speck of dust of an ethical problem here, will give up the budget to which we are entitled under the law and leave it in your hands, or rather in the Labor Party's hands. At our meeting on Thursday, I made my reservations clear concerning joining the Labor Party - the way it was done and the conditions under which it was accomplished (too high a price for the rotation you achieved and other issues that it is not the time now to enumerate). After I listened to you most attentively and in the light of your recent conduct, I understand even more that my natural place is not in Hatnua, the way it is developing, and it is apparent that I would face much difficulty in continuing my public service within this framework. Given the above and considering my views which are placed in the center of the political spectrum, I inform you that I have decided to quit the Hatnua party. Tzipi Livni has responded to the letter later Saturday night, saying she respects Stern's decision. "I respect Stern's decision to retire," Livni stated. "Stern is a man of values [. . .] I'm sure he will be able to contribute to the State of Israel anywhere he chooses to be. I wish him good luck with all my heart."